• A powerful search engine which offers the following information in its results: meanings in many languages, frequency of use, regularity type and transitivity. • You can hear the pronunciation of all verb forms by touching them on the screen. 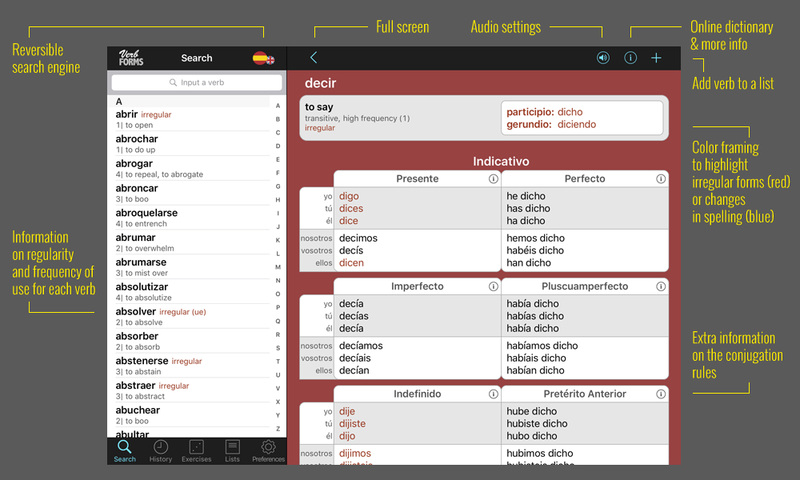 • Conjugation tables, with color framing to highlight irregular forms or changes in spelling. • Comprehensive information on the formation of conjugations, on all tenses, moods, and types of regular and irregular verbs. • Shortcut to online dictionaries (internet connection required).